Candidates need to pay an application fee of Rs. 100. Candidates can submit fee through online and offline mode. Download the SBI Challan for the offline payment and for online payment, candidates can use Net banking, Debit Card and Credit Card. SC/ST/PH and Female candidates are exempted from the payment of Application Fees. 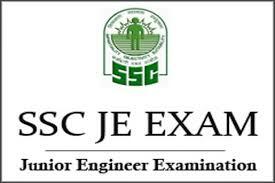 For registration, candidates have to visit the official website of the SSC JE. Enter the personal details like name, father name, date of birth and gender in the registration form carefully so as to avoid any kind of mess. Candidates are also required to fill their basic details like Aadhar card number, nationality, category and disability (if any). In contact part insert details like address, state, pin code, mobile no. and E-mail. Candidate should enter their details as mentioned in the Matriculation/Secondary Examination Certificates. Candidate must enter the captcha, which will be displayed, correctly for the confirmation. Before clicking the submit button, the candidate must check the information filled once again in order to avoid wrong information. Candidates will be taken to the windows where the tab for the new registration will be displayed, click on that tab. After the submission of the registration form, the candidate will be provided with the registration number and password on the screen and they will also receive the same through e-mail and SMS.